Discoveries on the mechanism of RNAi led to the 2006 Nobel Prize. Notably, these amazing studies were focused on embryo development, but unexpectedly revealed a previously unappreciated means of turning genes off. RNAi has revolutionized molecular biology, and highlights the importance of fundamental research. To learn more about RNAi, click here. Over the past fifteen years, RNA interference (RNAi) has become a nearly ubiquitous laboratory tool for reducing the expression of a gene of interest. Although the term RNAi specifically refers to the addition of double-stranded RNA to silence gene expression, various small RNA-mediated endogenous gene-silencing pathways related to RNAi play important roles in diverse organisms. At the heart of every small RNA pathway is the conserved Argonaute (AGO) family of effector proteins. The AGOs are guided by their small RNA partners in a sequence-specific manner to target transcripts, where they may influence gene expression at the level of translation, mRNA degradation, or even transcription. Perhaps the most widely known example of an endogenous small RNA gene regulatory pathway is the microRNA pathway, which was first characterized in C. elegans. The microRNA pathway has subsequently been implicated in regulating gene expression during plant and animal development, and misregulation of the microRNA pathway in humans has been shown to contribute to oncogenic transformation. For more about Argonaute/small RNA pathways, click here. In addition to regulating the mRNA and protein levels of target genes, emerging work in a variety of organisms indicates that small RNA-mediated activities also act in the nucleus to regulate chromatin and transcription. The modulation of chromatin by small RNAs appears to impact such key processes as gametogenesis, cell division, and cell fate specification, and is thus likely to play critical roles in both normal development and disease. Despite this importance, we have much to learn about how small RNA pathways regulate chromatin throughout animal development or about the functional consequences of such regulation. We use the tiny soil nematode C. elegans to examine how small RNA pathways regulate chromatin and impact animal development. Interested in learning more about epigenetics? We don't blame you, it's a super cool topic! 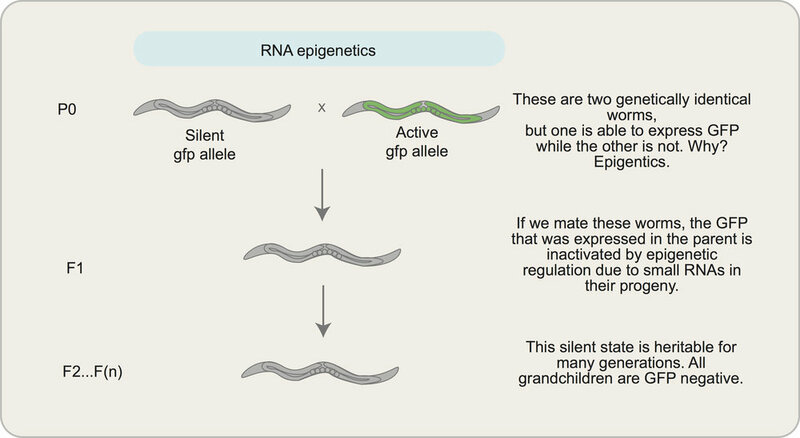 Here's a great basic primer on epigenetics that anyone can read and understand (even you, non-scientist friends!). Certainly you've heard of nature vs. nurture? This concept conveys that we are not merely a product of what is implicitly encoded our genes [DNA], but are also products of our experiences and exposures in life. This is not only true for humans, but extends to worms and all other creatures, and is being explored vigorously by the field of epigenetic research. Simply, epigenetics means "above genetics" or "above DNA," and refers to molecular messages that are not encoded in the sequence of As, Ts, Gs, and Cs in your genes. Yet these molecular messages are important and are capable of impacting the expression of genes, sometimes in a heritable manner. Imagine if your grandfather had an experience in life [lack of nutrition, exposure to a strange chemical, etc.] that altered the expression of his genes so that he could better cope with his environment [but that did not change the sequence of his DNA]. Now imagine that this molecular message, though not part of the DNA code, could be passed on to his child, so that s/he might also be better prepared to handle the stressful environmental condition, and that his child was able to pass on these same molecular messages to you! Clearly, these molecular messages must be passed on through the germline [simply, sperm and eggs] so that they become part of your epigenetic makeup, but what *are* they? Well, small RNAs, molecular modifications to DNA, and to the proteins associated with DNA [histones] can all serve as potent molecular couriers of an epigenetic memory over generations. As it turns out, with their short generation time and large numbers of progeny, worms are a fantastic context to dissect epigenetic inheritance. You might not want to hear this, but worms are remarkably similar to humans! Worms may be small, but they are mighty research tools that help us to understand how various processes occur in humans. Click here to read a fantastic primer on using worms in the lab. For more worm resources, see Wormbase, Wormbook, and Wormatlas. Worms (C. elegans) are fantastic little animals, which are perfectly suited for study in the lab. They grow quickly [from infant to adult in 3 days!] on petri plates in the lab (see photo above), eating a delightful diet of [non-toxic] E. coli bacteria. One worm can make up to 300 progeny, giving us plenty of material to do our biochemical and molecular biology experiments. Worms have a transparent body, making it easy for us visualize their cells and processes inside cells. Remarkably, adult worms only have 1000 or so cells, but many of these cell types and the molecules inside these cells are also found in humans, making worms an outstanding and simple model for understanding human biology and disease. Furthermore, we have mapped the lineage and fate [where a cell originates and what it turns into, from embryo to adult of each and every cell in the worm. This characteristic of worms makes them an outstanding model to understand normal developmental processes, such as how organs and tissues are built. There are also many laboratory tools we can use in our worm studies, including cutting edge genetic engineering [Cas-CRISPR genome editing]. Studies in worms have led to three Nobel prizes over the past two decades, so clearly, these little worms are enabling us to make amazing discoveries about fundamental biological processes. Argonaute proteins are the hub of amazing ribonucleoprotein (RNP) complexes with diverse functions. To learn more about AGOs in the worm, check out this review by JC and Dr. Elaine Youngman. C. elegans possesses at least 26 Argonaute proteins that fall into three categories: the Argonaute group, the PIWI group, and the WAGO (Worm-specific Argonaute) group [of note, humans only have 8 Argonaute family members, 4 AGOs and 4 PIWIs]. As the effectors of gene silencing, these various Argonautes interact with specific types of small RNAs [there are at least 4 types of small RNAs produced in the worm: miRNAs, piRNAs, 22G-endosiRNAs, and 26G-endosiRNAs] to regulate the expression of particular RNA transcripts [mRNAs, transposable elements, etc.]. Argonaute/small RNA mediated regulation of gene expression can occur in the cytoplasm or nucleus via a number of mechanisms, including transcript degradation, translational repression, and transcriptional control. For example, the well studied Argonaute group proteins ALG-1 and ALG-2 interact with microRNAs to silence gene expression of developmentally important genes at both the protein and mRNA level. Although we understand the functions of some of these Argonautes, many have not been studied yet, and much remains to be discovered about the distinct and overlapping activities of the C. elegans Argonautes. We are especially intereted in Argonautes that play roles in the nucleus. To learn more about worm small RNA pathways that function in the nucleus, click here. Projects are available to study uncharacterized Argonautes, both at the systems level and on an AGO-by-AGO basis. We use an integrated combination of classical genetics, genetic engineering [Cas-CRISPR, transgene studies], microscopy, molecular biology/biochemistry [IP, AP/MS, in vitro assays], and genomics [RIP-seq, CLIP-seq, mRNA-seq, ChIP-seq, and more] to study these fascinating proteins. CSR-1 is an extremely interesting AGO protein. 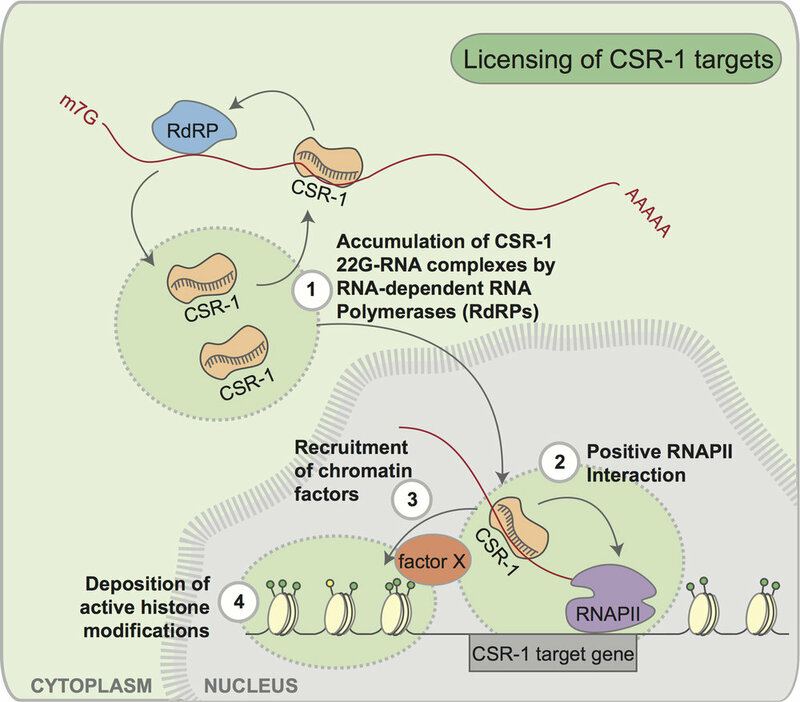 To learn more about CSR-1, check out this review by Chris, Monica and JC. To learn more about how CSR-1 antagonizes the piRNA pathway to promote germline gene expression, check out this commentary by Chris, Monica and JC. The Argonaute CSR-1 [Chromosome Segregation and RNAi Deficient, pronounced like Julius 'Caesar'] is essential for the worm's reproduction and fertility. CSR-1 is expressed mainly in the germline, where gametes [sperm and eggs] are produced. CSR-1 is guided by its small RNAs [22G-RNAs] to recognize its target genes in the germline. Nearly 5000 genes are CSR-1/22G-RNA targets, which entails ~25% of the total number of genes in the worm genome, and is ~50% of the germline-expressed protein coding genes [that's a lot of genes!]. Our immunolocalization studies have demonstrated that CSR-1 is present in both the cytoplasm and nucleus, suggesting that CSR-1 could function post-transcriptionally and/or co-transcriptionally. In fact, our ChIP studies show that CSR-1 is present at the chromosomal loci of its 22G-RNA targets, and our co-IP experiments show that CSR-1 interacts with RNA Polymerase II (RNAPII) in an RNA dependent manner. These data support the model that CSR-1 is guided by 22G-RNAs to target gene nascent transcripts, where it can regulate gene expression. We hypothesize that CSR-1 interacts with various histone modifying proteins and chromatin factors to influence the landscape of chromatin at its target gene loci to impact transcription. Much to our surprise, our earlier studies indicated that CSR-1 does not silence the expression of its targets, but instead promotes their expression [i.e., CSR-1 is an Anti-Silencer!]. We determined this using an in vivo tethering assay, where we recruited CSR-1 to one specific gene in the genome. When CSR-1 was not recruited to this gene, it would normally be silenced by the piRNA pathway. The piRNA pathway can be thought of as the adaptive immune system of the germline, surveying for invading nucleic acid sequences, and stopping them in their tracks before they damage the genome. Remarkably, when CSR-1 was tethered to the gene, it was protected from silencing by the piRNA pathway and remained expressed in the germline! This observation shifts paradigms: Argonautes are not only capable of silencing gene expression, but can also promote the expression of their target genes! We are now also examining the role of CSR-1 in other nematodes using comparative genomics, and have found evidence for a conserved role for CSR-1 in promoting gene expression. Currently, we are dissecting the molecular mechanisms by which CSR-1 impacts chromatin and gene expression, and have identified new nuclear factors that act in the CSR-1 pathway, such as the conserved Intron Binding Protein/Helicase EMB-4/Aquarius. Projects are available to study the mechanisms of CSR-1 activity on chromatin and gene expression. We are using forward and reverse genetics as well as biochemical approaches (co-IP, AP/MS) to identify factors that function in the CSR-1 pathway. Genetic engineering [Cas-CRISPR, transgene studies] of CSR-1 and in vitro assays enable us to perform structure-function analyses of CSR-1. Microscopy and genomics [RIP-seq, CLIP-seq, mRNA-seq, ChIP-seq] allow us to determine how CSR-1 impacts chromatin and the transcription of its germline targets. Other projects are available to explore the piRNA pathway, especially regarding the adaptive steps of the process. We also have evolutionary projects, using comparative genomics to understand how the CSR-1 and piRNA pathways function to defend the germline genome. H. polygyrus uses small RNAs to communicate with its host (mice) and manipulate its environment (the intestine) in favor of its persistence in the host. To learn more about H. polygyrus, click here. In collaboration with Drs. Amy Buck at the University of Edinburgh and Cei Abreu-Goodger at Langebio-CINVESTAV, we have recently embarked on studies to understand how small RNAs could function as a means of extracellular communication, and even as a means of communication between organisms. We know that small RNAs can exist outside of cells, and that they can be transferred from one cell to another [either as "naked" RNAs or within tiny membrane-bound delivery packages called exosomes] within an organism. In a recent key paper, Dr. Buck demonstrated that small RNAs and and an Argonaute protein secreted from the intestinal parasite nematode, H. polygyrus (now called H. bakeri) are capable of impacting gene expression in a mouse host. The mechanisms and implications of this means of molecular communication are only beginning to be explored, but clearly this is an exciting new realm of small RNA-mediated gene regulation. Our team is applying an integrated approach, including biochemistry, genomics, and computational biology to explore this process, and specifically, the Claycomb lab is utilizing C. elegans as a tractable experimental proxy for the somewhat difficult to culture H. polygyrus. What stresses do you think Wormzilla is experiencing here? We are becoming more and more fascinated by how the environment [temperature, food supply, toxins and chemicals, light/dark, oxygen levels, etc.] can impact gene expression, and how small RNAs play into this process. We have a myriad of projects ready for YOU to join us and investigate how environmental stresses are received, integrated into changes in gene expression profiles [via small RNAs, of course! ], and then how this information is transmitted epigenetically to the next [and many subsequent] generations. These are, at the moment, unfunded mandates, but that's never stopped us before! Come be part of this fun [and generate data for future grant proposals! ].